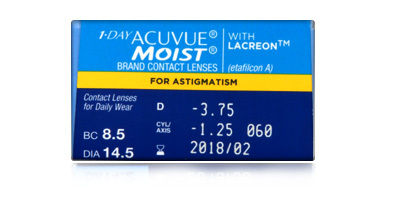 Made specially for wearers with Astigmatism and manufactured by Johnson& Johnson thesecontact lenses combine LACREON technology and BLINK STABILIZED design. 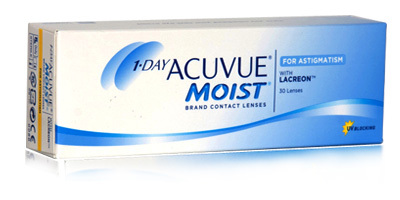 Throughout the day, you can experience comfortable and clear vision consistently with the 1 day Acuvue moist for astigmatism 30 pack contact lenses. The LACREON technology used in these lenses ensures a silky smooth cushioning effect in the eyes. 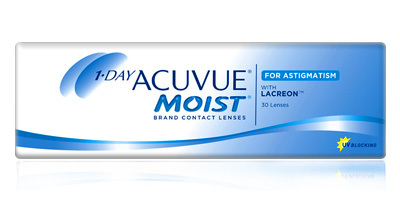 Their high moisture locking capacity gives your eyes a fresh feel the entire time.